Vessel service as beginning and closing of the entire chain of services in the port holds a vital role in achieving the overall performance of port services. The most important performance indicators are waiting time and readiness tugboat. Achievement of service performance boat, with two main activities namely scouting service and delays, largely determined by the quantity and quality of equipment, human resources and proper systems & procedures. 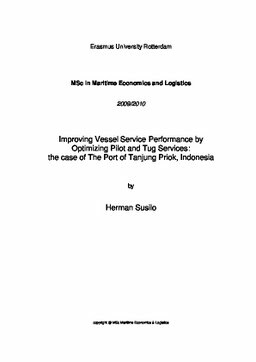 This thesis takes a case study at Port of Tanjung Priok as a major port in Indonesia, where the service ship is currently one of the problems that cause service user complaint. The complaints are mainly due to high waiting time for ships. From the results of a preliminary evaluation of vessel service, cause of the high waiting time at the Port of Tanjung Priok is the lack of pilot and tug boats which is the main production factor of service ship. In this study, the authors calculate the optimal number of pilot and tugboats for supporting the achievement of a zero waiting time target. In addition to the adequacy of the number of equipment in this study the authors also evaluate the systems and procedures, asset maintenance systems that determine the readiness of equipment and management systems used. In this study, the authors also evaluate the position of Port of Tanjung Priok Port in the port industry development in Indonesia and internationally, primarily associated with regulatory changes in the Indonesian ports management, where the industry becomes more open and competitive, and position in competition with international ports around. Segment of vessel service at Port of Tanjung Priok in addition to support the achievement of operational performance also contribute substantially to the company's financial performance. So in addition to optimizing operational performance, this thesis also evaluated the system and form of management of pilotage and towage services that more efficient and flexible. In order to face of competition in the port industry after the implementation of new port regulation that is more opened and competitive, it have to find new management system that more flexible. In the final section of this thesis, the authors propose several improvement plans related to the investment of equipment and human resources, asset maintenance system and also a proposal to change pilotage and towage services as a separate strategic business unit.